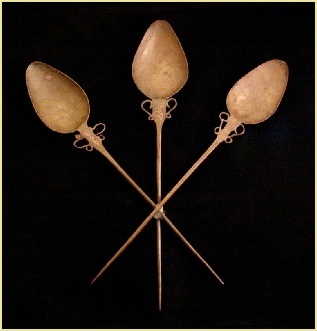 A lovely set of three hand crafted bronze Inca/Quechua TTipqui - post contact. Sets of two tupus (normally sized around 6" in height) are rarely seen at one time as only one is usually produced for an individual. Here, a set of three large pieces are being offered. Each measures over 10"/25.4 cm. In Fine condition. Peru 18th to 19th century. Handsomely displayed in a 12" sq. shadow box.